In his book To Die In Mexico, U.S.-born journalist John Gibler describes a meeting with Salomón Monárrez, one of the founders of a Mexican human rights group called the Sinaloa Civic Front. Monárrez had survived an assassination attempt in his home, during which he was shot six times at close range. This death sentence had been pronounced against him, so far as Monárrez could tell, because the Sinaloa Civic Front had recently brought a public lawsuit against a group of Mexican soldiers who had massacred two carloads of civilians—including a family of schoolteachers and their three small children—in a supposed anti-narcotics operation. One of Monárrez’s colleagues in the Sinaloa Civic Front had already been murdered for investigating the same case. Speaking to Gibler, Monárrez was curious to know whether people in the United States were shocked by stories of such atrocities. “What impression do people there have of us here with all this death?” he asked Gibler. Gibler writes: I fumbled to avoid the most truthful response—most people in the United States do not even notice and many do not care. Last year was Mexico’s deadliest on record, with over 29,000 people murdered in the country’s escalating drug-related violence. Yet day-to-day coverage of the violence in the U.S. mainstream press has been negligible. Since August 31st, 2017, the New York Times has published 11 stories in its category “Mexican Drug War.” Three of those were about the extradition and trial of El Chapo. One was an op-ed about the renegotiation of NAFTA. Another was an op-ed about U.S. drug policies. One was a review of a book about drug cartels’ surprising levels of involvement with horse racing. That leaves only five stories actually reporting on the violence itself. (We also found several other Mexico-related stories that were not tagged under “Mexican Drug War,” such as a Travel section feature on whether tourists are safe. This brings the total from August up to about 16.) CNN was even worse: in the same period, we can find only three stories about drug-related violence in Mexico. One can object to the tone and intention with which Breitbart reports these stories—but the fact remains that they are not inconsequential or insignificant news items. A cartel taking over a city? The kidnapping of federal police officers? A state mayor’s drug-laden tractor trailer being seized? If these occurred a few miles further north, in California or Texas, they would be national news. If they happened in London, they would be news here. But they are happening in Mexico, and Mexico does not matter very much to the U.S. media. If President Trump had had to postpone a visit to Chicago because of a city-wide gun battle, it’d have been reported all over the world. President Peña Nieto, meanwhile, recently had to cancel a planned visit to the city of Reynosa—just across the border from the U.S. city of McAllen, Texas—because of an ongoing turf war between two cartel factions. Nobody but Breitbart even noticed. We know that there is a hierarchy of victims in the press: disasters that befall Americans and Europeans are given far more coverage than those that impact people in less developed countries. Some lives are simply valued more highly than others. Worse, this is often justified with the perverse principle that “because violence is more common in [name of country], it is less newsworthy.” When applied, that rule means that the more people suffer and die, the less the media will be interested. What you end up with, then, is the kind of reporting on Mexico that the New York Times does: every few months, they will simply do a story reminding us that the situation is deteriorating, perhaps profiling a town that is bucking the trend (or reviewing a book about why cartels like horses). These stories must have an angle, there must be some Reason Why Readers Will Be Interested. Of course, when the annual murder statistics come out, there will be a story. Likewise, if some bodies are found near a resort, CNN might run something. But otherwise, there is little everyday reporting on each individual instance of serious violence. Look at the Washington Post‘s coverage from the last year, which is better than that of many other outlets. The stories are about trends rather than events (Violence soaring, cities deteriorating, justice system crumbling). Mexican deaths make it into the press as aggregate statistical units rather than individual tragedies. They react to pressure in the media. This is very serious. I mean, if gunmen kill a thousand people here in a month, it won’t cause any reaction from the government. But if the New York Times or El Pais in Spain publishes a story about it they shout ‘Ah!’ For the government this is when something happens, not when it happens but when it gets published. This is a gravely serious problem… This is a serious part of what is sustaining this mess. Today, the situation is all the more dire because Mexican journalists, who were already working under impossibly dangerous conditions, are now being murdered at record-breaking rates. Reporters in Mexico have long since lamented that investigative journalism in the country is effectively dead. Forget full-length exposés: even printing the wrong detail in a bare-bones crime report can put you in the cross-hairs of one or more cartels, or Mexican military and security forces, or local elites, all of whom have formed complex webs of rivalries and alliances as they seek to control the lucrative drug trade. As local Mexican media is driven into ever-more cryptic, minimalist reporting tactics—or forced to shutter altogether—the story of what is actually happening in violence-plagued states and cities becomes increasingly muffled, and prone to distortion by disseminators of public disinformation. Mexicans under threat who flee to the U.S. to seek protection then face a serious uphill battle in their asylum or torture protection cases: judges and asylum officers, like the broader mass of Americans, do not understand what is happening in Mexico, and immigration lawyers will often find that the likes of Breitbart is the only source with anything resembling up-to-date information. If the U.S. media needs an “angle” to justify why this reporting should be relevant to U.S. readers on a daily basis, why not point to the intimacy of the connection between our countries’ policies and the deaths of thousands of Mexicans? The United States bears significant responsibility for the violence in Mexico in many ways. It is our country’s demand for drugs, and our war on them, that drives up prices and makes trafficking such a profitable and alluring enterprise to begin with. The whole reason that so much of the violence is occurring along the border is because the United States is on the other side. Those 29,000 deaths are in very large part the fault of this country’s policies, and this country’s insatiable demand for hard drugs. To wall off Mexico (figuratively) in our minds, as a place whose troubles have nothing to do with our own, is to willfully ignore important and troubling questions about what we might be doing that is causing mass bloodshed to occur right on our doorstep. A necessary first step is for the U.S. media to treat this bloodshed as the severe crisis that it is. All human lives are equal and none should be ignored. At the very least, the U.S. press should be covering violence that happens within 100 miles of the U.S. border, whether it falls on this side or the other, with diligence and seriousness. More broadly, too, influential U.S. news outlets must make themselves into daily megaphones for the voices of Mexican journalists and ordinary citizen observers who risk death to speak the truth about the authors of the massacres in their communities. This is a serious ongoing failure of American journalism, one that media organizations urgently need to work to fix. 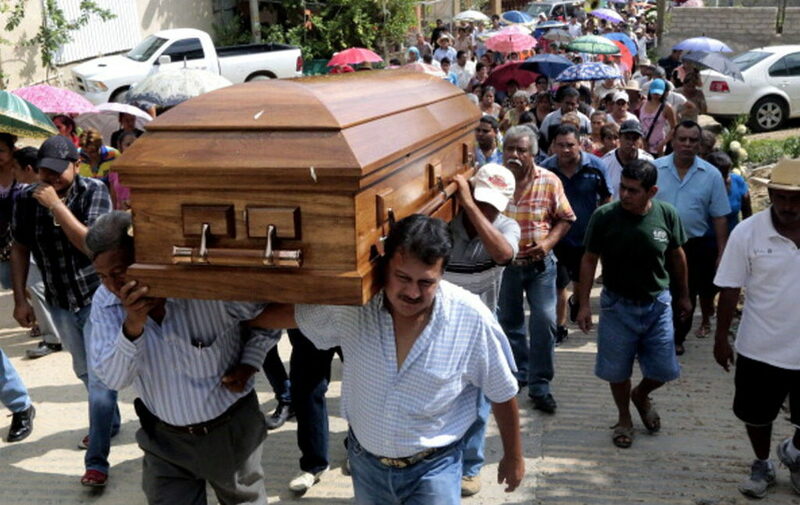 Photo: A group of men carry the coffin with the remains of the late journalist Jorge Torres—who was kidnapped on May 29 and found dead on the eve– during his funeral at the Kilometro 30 village, in Acapulco, in Guerrero state, Mexico on June 3, 2014. Pedro PARDO/AFP/Getty Images.